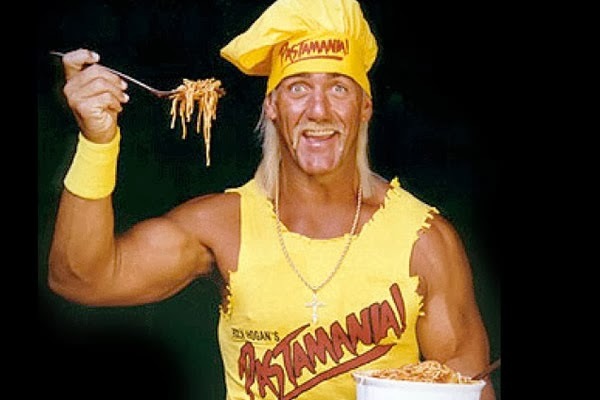 As the Hulkster proclaims in the video, eating at Pastamania! allegedly kept hungry fans slim & trim (it’s hard to believe, but then again Hulk Hogan would never lie to Hulkamaniacs and Pastamaniacs). Sadly the restaurant’s reign as king of the food court would be short-lived. Pastamania! was shut down less than one year after it being open. Food critics, world renowned top chefs and restaurant entrepreneurs would never find out what secret ingredients Chef Hulk used to create exquisite dishes like the Spaghetti & Hulk-Balls and Hulkuccine. ← DEATH TO FALSE VAMPS. Where the hell do you dig up and find these amazing hidden treasures? Your blog should be taught in every classroom in America of today. This lifestyle should be studied, loved, and lived. Crazy stuff. Dude I love you.